This dip module is a high-quality upgrade for the Kettler wall bars. High-quality arm layers and non-slip rubber handles give a good stability while doing your exercises. Dips and leg lifting exercises can be done especially well. With the „Fast-Click system“, you can quickly mount or dismount the module during the training. 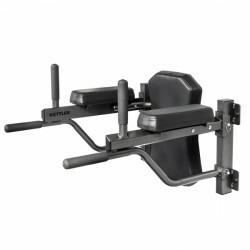 Kettler training bench for wall bars In stock!